I am a pretty solid gift-wrapper, but I don’t usually go outside the box. Wrap neatly, add bow or ribbon, and ta-da! Pretty gift. 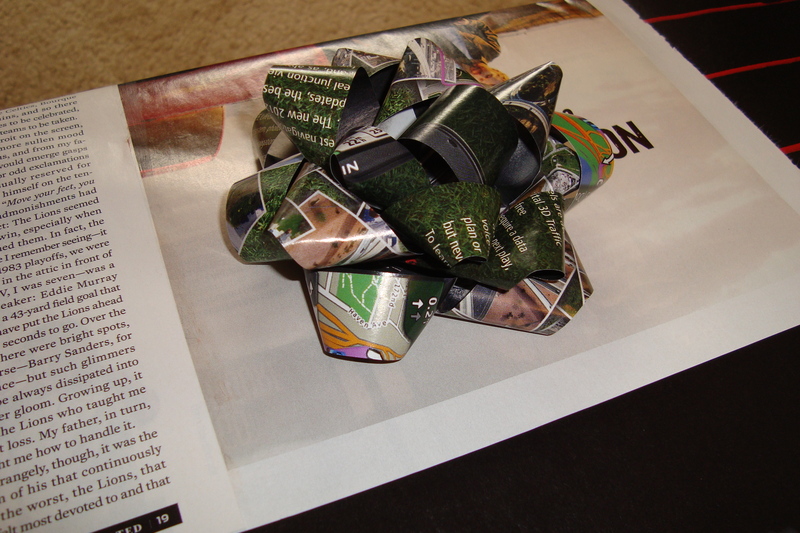 But today I was feeling a little crafty, so I decided to do something a little different and wrap a gift in recycled magazines. It looked nice, but it needed a little. . .something. And you can’t put a store-bought bow on a magazine-wrapped gift! A quick google search led me to this awesome how-to. Follow the author’s instructions, and it’s really as easy as described. Here’s my finished product. Personally, I love the result!